DIY Laundry Soap, plus Alternative Bleach, Fabric Softener, Deodorizers, and Stain Removers — Replace ALL Your Laundry Products! (Written by my friend, Jill Boman) Most commercial laundry products are nasty pollutants to the environment, our homes, and our bodies, which is ironic when you think about it because we use them to make our clothes clean, but they are polluting us instead, go figure… (This study confirms that scented laundry products release carcinogens.) Today I want to provide you with several alternatives to petrochemical-based laundry detergents, fabric softeners, dryer sheets, bleach, and stain removers that will spare you the toxins while also sparing your pocketbook $$$. 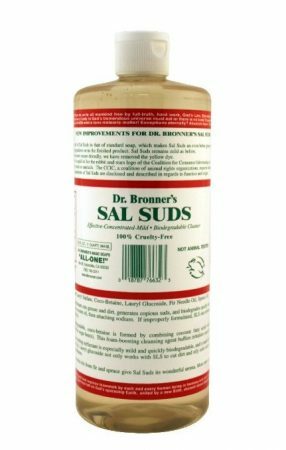 If you are not the do-it-yourself type, I'll save you some time and mention the first alternative right off the top: Dr. Bronner’s Sal Suds. Sal Suds is not technically a true soap, but is made of natural plant-derived surfactants (real soap is the result of a chemical reaction that takes place when sodium hydroxide, AKA lye, is combined with plant oils and/or animal fat). Sal Suds is a concentrated, all-purpose household cleaner that cleans laundry brilliantly and rinses out completely. I will add that while liquid Castile soap (which is a true soap) also works well for laundry, Sal Suds is more effective in hard water and in my experience, more effective on odors like stale towels and workout clothes. Add 2 Tablespoons (one ounce) per regular load; half as much (1 Tablespoon) for high efficiency (HE) machines. Use slightly more for heavily soiled large loads. If you buy a 32 ounce bottle of Sal Suds, it works out to about $0.50 per regular load, or $0.25 cents per HE load. 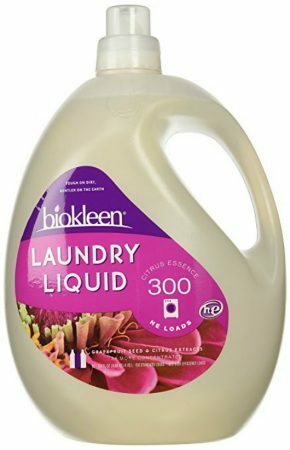 For non-toxic commercial laundry products (formulated specifically for laundry as opposed to all purpose cleaners like Sal Suds), I've had great results with Biokleen. Not only is the company still family owned and operated (rare nowadays), the Environmental Working Group gives all of their current laundry products an A rating, which means there are “few/no known or suspected hazards to health or the environment” and that the product has “good ingredient disclosure”. I've used both the liquid (including Sport Laundry Liquid) and powder with great results: clean and fresh smelling clothes, extremely concentrated product (making it economical), and clean rinsing with no residue. That said, I prefer the liquid, as the powder hasn't always dissolved perfectly for me in cold water. All of their laundry products work well in both standard and high efficiency machines—you simply use half as much in HE machines, making it even more economical. As a side note, their Automatic Dish Powder is by far my favorite dish powder. It also has an A rating from EWG, is very concentrated, and it actually cleans extremely well without leaving a film or nasty perfume fragrance (or taste—yuck!) on glassware and dishes (a rarity, in my experience, among non-toxic and natural dish powders). To soften your clothes, look no further than plain, white distilled vinegar (any vinegar will do but this one’s the cheapest). 1/4 to 1/2 cup vinegar added to the rinse cycle (I just put it in my fabric softener compartment) will soften your clothes without coating them with petroleum oils or endocrine-disrupting synthetic fragrances like most commercial varieties do. Vinegar also removes any soap residue. Don’t worry, it rinses completely and won’t leave your clothes smelling like pickles! If static is a problem at your house, I recommend using wool dryer balls in the dryer. Alternatively, some people swear by using a crumpled ball of aluminum foil the same way. Also, over-drying your laundry encourages static. Dry *just enough* then remove your clothes to fold. oxygen bleach. 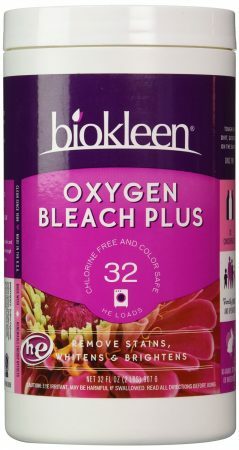 Two popular brands are Oxiclean and BioKleen Oxygen Bleach Plus. Personally, I use BioKleen—it seems to dissolve especially well. But both work wonderfully, not only to safely brighten and whiten clothes, but also for other stain-removing type cleaning projects like scrubbing tile grout. By the way, I’ve tried some DIY bleach recipes in the past (using ingredients like hydrogen peroxide and lemon juice), but they just don’t work as well for me as commercially available oxygen bleach. If you have a recipe that actually works, please share it in the comments! Apply a few drops orange or eucalyptus essential oil oil directly to stain before laundering. Both are fantastic solvents that work wonders on oil stains. To pre-treat, wet the fabric, then rub a bar of soap directly on stain. Rub it in, using the fabric folded against itself to give the spot a scrub. Alternatively, you can rub into wet fabric either straight commercial laundry detergent or homemade laundry soap powder to make a paste (recipe below). On white or very pale colors, you can also wet the fabric then rub in powdered oxygen bleach to form a paste, with the fabric folded against itself to scrub as described above (gals, this actually works great on menstrual stains in underwear). For protein-based stains like blood, be sure to only use cold water so that you don’t set the stain. To remove sour laundry odors (like the type that forms when sweaty clothes are wadded up in the laundry hamper for days—moms of teenage boys, you know what I’m talking about! ), presoak your load in cold water with 1/2 to 1 cup vinegar added (depending on size of load) for 30 minutes to an hour. You may notice the laundry area smelling extra funky during the soak, as if the stink is lifting out of the clothes and into the air. Spin the water out of the clothes then wash as usual. 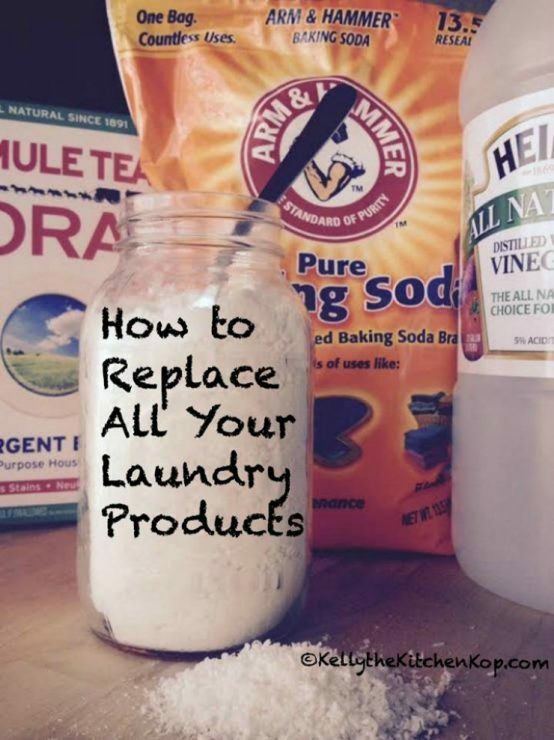 A cup of baking soda added to the wash cycle is worth a try as well. Note that in general, vinegar is a better rinse aid, and baking soda is a better washing aid. Biokleen's Sport Laundry Liquid also works well for eliminating gym clothes smell. Consider using a deodorizing essential oil blend in the wash or adding it in with either Sal Suds or a homemade laundry soap recipe (recipes below). * Most DIY laundry soap recipes call for washing soda, but baking soda also works to boost the soap and soften water. The main difference is washing soda is more alkaline, and has a bit stronger cleaning power. The high alkalinity means it is also caustic and can cause skin irritation on contact or lung irritation if its dust is inhaled. 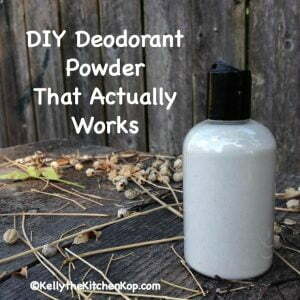 I personally use baking soda instead. It also boosts cleaning but it is more gentle on my hands when I’m mixing up a batch of soap (I make BIG batches), and more gentle on clothes. I read once on a cloth diapering forum that it’s better to use baking soda than washing soda in DIY laundry soap for washing diapers because it leaves the diapers softer, which makes sense because very high alkalinity roughs up fibers. ** There is some controversy in crunchy circles about the toxicity of Borax. 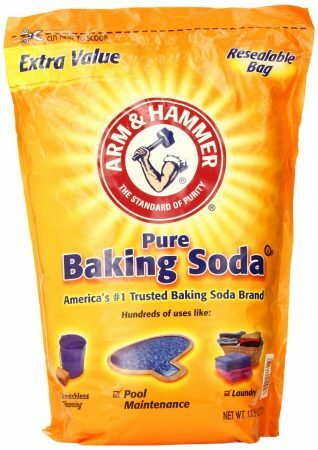 I personally feel fine about using it in my DIY laundry soap, but if you are uncomfortable with it, you can substitute baking soda and your soap will still work great. Add soda and Borax to a 2 gallon bucket. Cover by about an inch with hot water (they dissolve more easily in hot water). Using an immersion blender, blend until no lumps remain. Fill to the level of nearly 1 gallon with water (cold or room temp is fine). Stir in the liquid Castile soap (but don’t blend it with the immersion blender or it will get foamy). When your liquid laundry soap reaches room temperature you can stir in essential oils if desired (start with about 30 drops, and adjust as desired). Citrus essential oils are my favorite (orange, lemon, or grapefruit), and lavender is always a popular choice, but you might want to consider a germ killing blend like Plant Therapy’s Germ Buster or their Deodorizing Synergy. Pour laundry soap into a clean gallon jug (a funnel helps prevent spills). To use: add about 1/4 cup per load for regular top-loader machines; 1/8 cup per HE machine load. Use slightly more for very heavily soiled large loads. Some separation is normal. Simply shake or slosh around before using to remix as needed. 1 4-ounce bar natural soap (I REALLY like this soap for laundry, especially their fragrance-free bar. It’s made with 100% coconut oil, which has superb cleaning powers, fragrance-free means I can scent it with whichever essential oils I like, and it’s very affordable.) 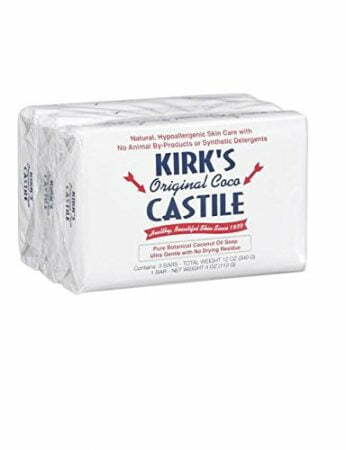 Fels Naptha or Ivory Soap are popular choices, but I MUCH prefer Kirk’s. It’s all natural and I think it dissolves better in the wash. Dr. Bronner’s bar soaps are also popular, but they are more expensive. 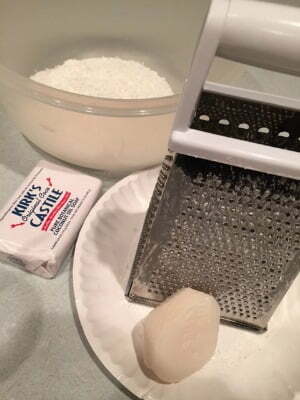 Place grated soap in your large mixing bowl (it will be “fluffy” and take more space in your bowl until you mix it up). Add soda and Borax. Stir to throughly combine. Place in a clean container with an airtight lid (repurposed yogurt or other food containers work great, as do jars). * Tip: If using essential oils, mix essential oils with Borax separately before adding to your mixture. I have found that Borax absorbs essential oils beautifully, but when I add essential oils to my finished product it tends to clump and not mix in as well. To use: Add 1 Tablespoon per large load in regular top-loader machines; 1/2 Tablespoon per HE machine load. Use slightly more for heavily soiled, large loads. A Final Note (Update): If over time your homemade laundry soap or any other product recommendation in this post is not working well for you (each area's water is going to be different as well as each family's laundry needs and preferences), there are several laundry detergents, soaps, and other products with A+ scores (for environmental soundness and low toxicity) at the EWG's (Environmental Working Group) website. Actually, you might want to hop over there now just to check the score of what you've been using! 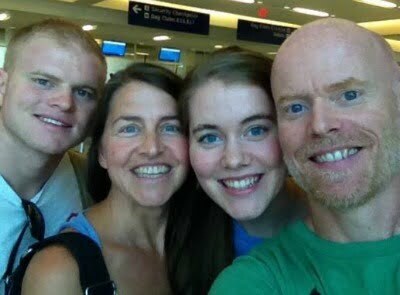 About Jill: My husband and I live in Waco, TX, along with our two awesome young adult kids. I have a small business, selling handmade personal and home care products at our farmer’s market and local retail sites. I am also Kelly’s blog assistant. 🙂 I am passionate about real food nutrition, natural health, local food, and I love to cook. Fortunately we have access to lots of local food via our fantastic farmer’s market, nearby farms, and even a grocery store that sources much of its food locally. See all of Jill's posts here. 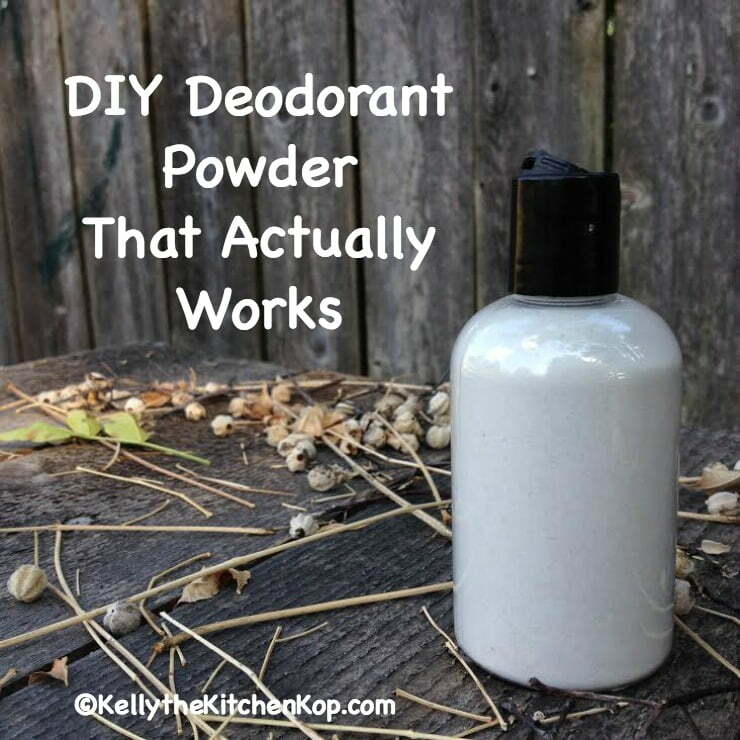 DIY Deodorant that Actually WORKS! You’ll be surprised at how well it works on oil stains, Amy! Orange oil works too (I think lemon and grapefruit may work in a pinch too). Just experiment with whichever of those you have on hand. Thanks! I will definitely be trying the eucalyptus essential oil on oily stains. The only thing in the world that I have found to work on them is Dawn dish detergent, which I absolutely hate to use.